A few weeks ago I bought a tap extension for my front garden tap (currently it lurks in an relatively inaccessible place and this tap extension will just make things easier) and this morning I wandered down the steps into the front garden to fit it, and … was caught by surprise. What happened? Where did this glorious garden come from? The front garden always catches me by surprise as it is so dreary during winter and then, suddenly … wow. So I took some photos. Click on the photos for larger ones. 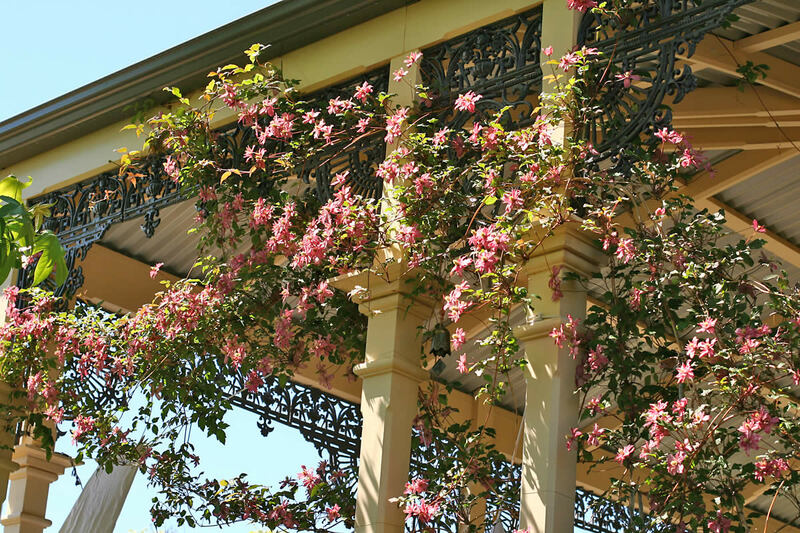 First, a couple of the front veranda which is currently festooned with great, glorious swathes of clematis. Isn’t this just amazing? By the front door – one of the heavier festoons. The three lamps there are solar lamps, and at night they glow a deep golden colour. 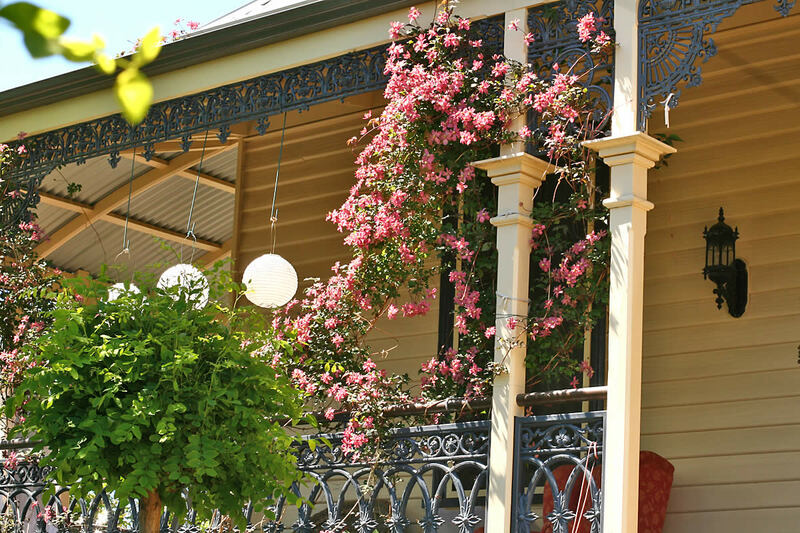 The window is my bedroom window, and my bed head is right under the window – so at night I lay in bed and I have a view of three golden globes hanging between festoons of clematis and beyond that the lights of the outer hills of Hobart. It is sheer magic. A bit further down the veranda. 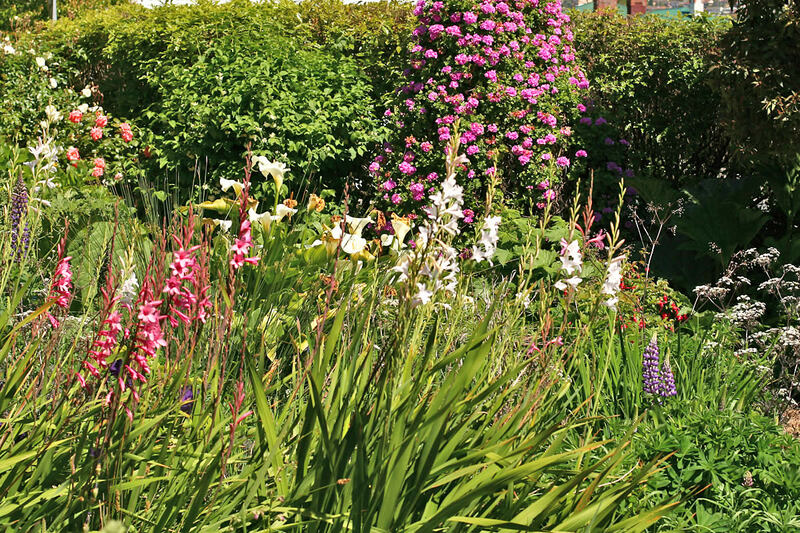 Now into the front garden – first an overall view of the main part of the bog garden. 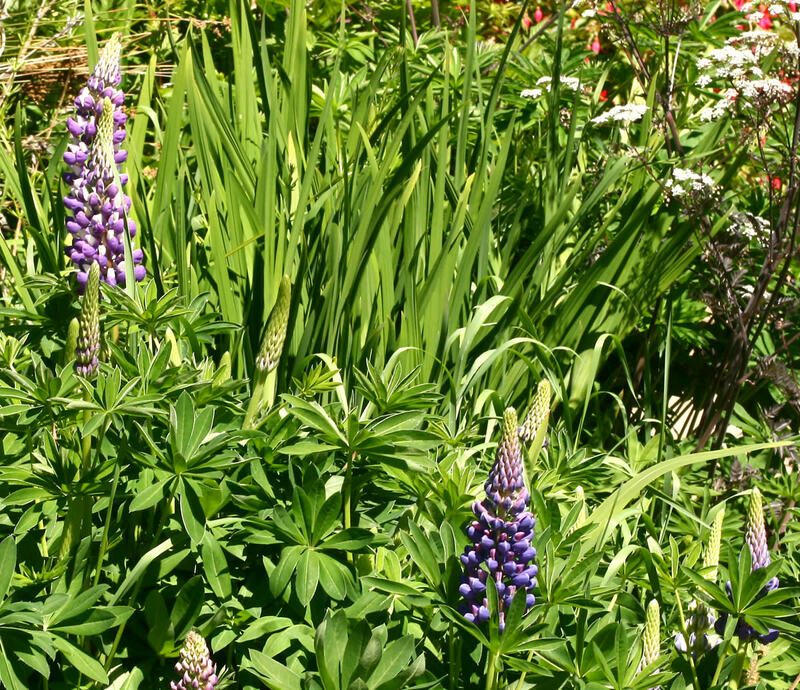 The lupins are almost out – here they are starting some of their stunning spires – grow to about 5 feet high. They come in this purple as well various shades of pinks. Some of the watsonias – these are only just starting to open up. 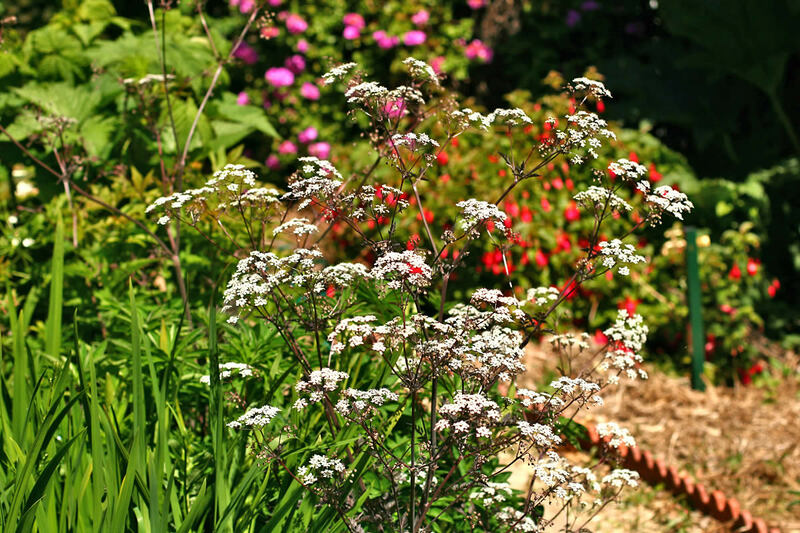 The lovely, delicate flowers of the bronze-lace-leafed plant that has self-seeded everywhere. I can’t remember its name, unfortunately. This seeds everywhere – I even found some of them happily starting up in one of the new raised garden beds with new soil – lord alone knows where the seeds came from! 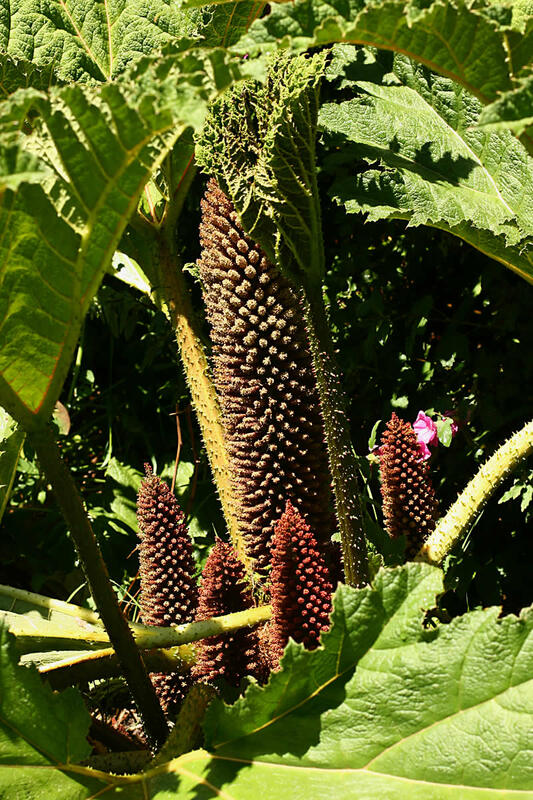 The gunnera are starting to send up their (gigantic) flower stalks – when they are mature they are deep scarlet. Currently the larger stalk is about 4 feet high. 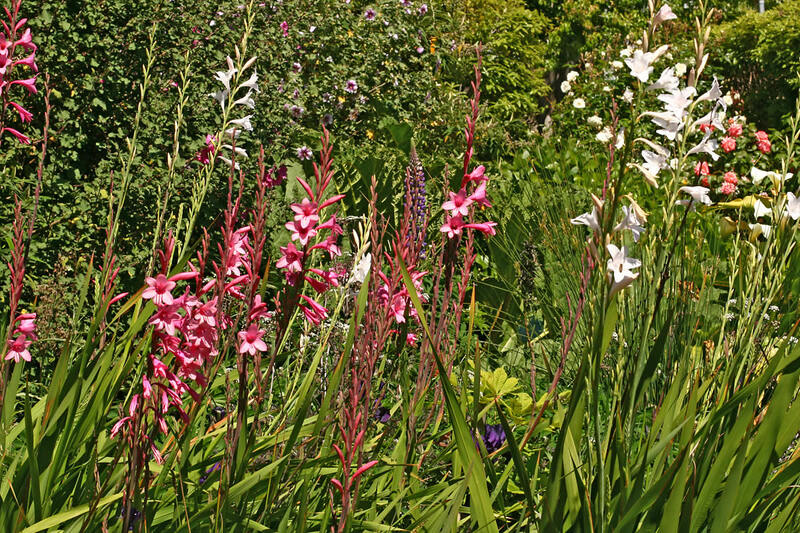 The flowers are spectacular elsewhere, too – the good winter rains have brought everything to their best. Here a blackboy rose clambers over one of the cats’ enclosures. It is about 3 metres high when you stand next to it (there is a sunken path you can’t see to the right of the rose). The green in the foreground are potatoes. By the end of winter I almost hate the garden. It has taken its toll as I have done all the hard labour through the cold months. This year was worst than most as I had so much cleaning up to do after abandoning the garden for a year. Then, spring arrives, and the garden says thank you. I always have to remember that paradise hangs shadowed in the forgotten corners of gardens. The phrase came to me in a moment of inspiration, and the beautiful mosaic bowl (needing a bit of a scrub!) is by a woman called Marian Shapiro. 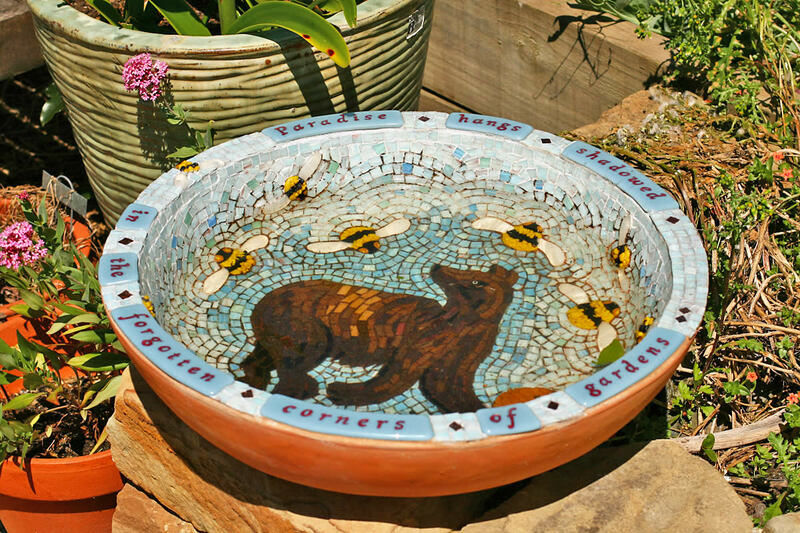 The bear and the bumblebees have no real significance, save that I loved the imagery and asked Marian to use it as a motif for the bowl. 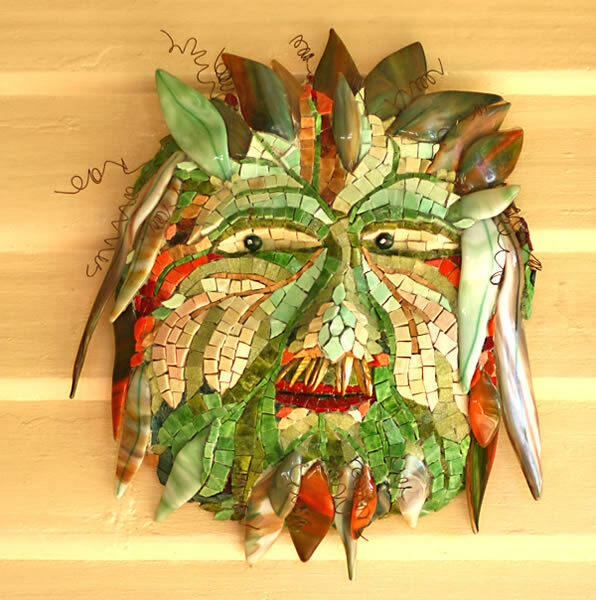 Marian has done some 10 mosaic garden bowls for me, also this amazing Green Man who hangs by my front door. (This image is not clickable.) Read the legend of the Green Man here. I am in awe. Beautiful gardens Sara. All your hard work is showing itself in breathtaking fashion. I love the mosaics. How big is the Green Man? Beautiful garden sara, does the green man take any credit for its surprise appearance? What a mosaic! So fantastic! I love Marian’s work and colourful website. Cheers for another great find. Some lovely pics – and a great reward for all your hard work! Thanks for sharing. Your garden is so lovely! I must confess I am jealous. I am in Queensland and at the moment the heat is radiating off the dry grass. I have not had any luck with many flowers except for my little pink lillies which only flower after the rain. I have Bottle trees and my vege patch, which the kids and I planted, was just eaten by the horses. (My husband let them in by accident) However in my head there are so many possibilities and I am so inspired by the wonderful colour in your garden. 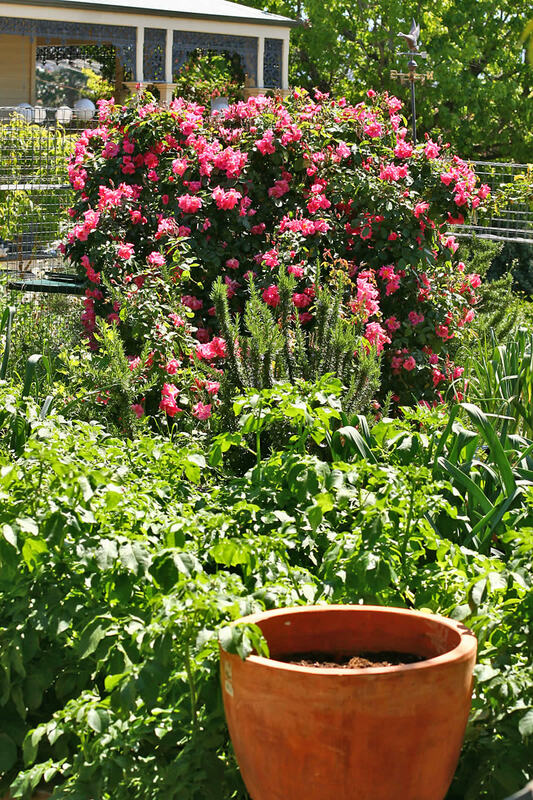 Thank you for sharing your garden with us. First time poster, I’ve watched your garden grow for years. I love reading about it and seeing pictures of your home. I can only hope to build such an amazing retreat to live and write in one day!